The Errin J Vuley Fellows Program (EVFP) is a leadership development program launched by Feminist Women’s Health Center in 2017. Errin J. Vuley was the first Community Engagement Coordinator (1997-1999) at the center. 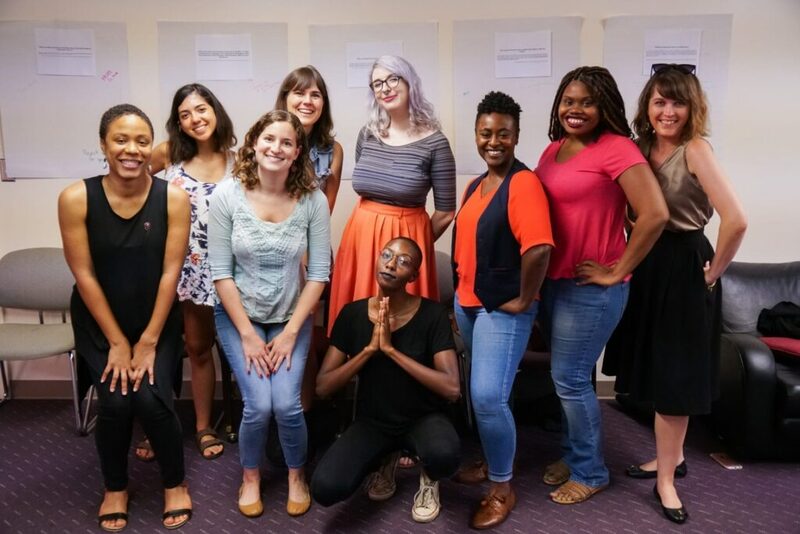 EVFP uses a reproductive justice framework to strengthen and build leadership skills and knowledge and especially honors Errin’s passions – abortion access, trans justice, and racial justice. Monthly Events: Fellows meet monthly for interactive workshops that progress from expanding their knowledge and skills to opportunities to apply what they’ve learned and showcase their collaborative work. The program’s events are designed to accommodate the schedules of a diverse group, including those with work, school, and other scheduling needs. Social Justice Networking: Facilitators vary for each monthly event and include community partners and social justice professionals. We are committed to ensuring that our fellows graduate with an expanded network of local social justice experts as well as with the knowledge of how to delve deeper into their areas of interest. Launch Forward Awards: Each graduating fellow will receive a Launch Forward award uniquely tailored to their passions and interests. The award is designed to provide a modest “starter kit” with small funding or tools to complete a project or launch a social justice initiative. We hope this culminating encouragement will ‘”launch forward” these incredible social justice leaders. Apply to be a Fellow: We are now accepting applications for 2019. You can fill out the online application form here or email this downloadable version to leighb@feministcenter.org. Volunteer with us: Throughout EVFP’s inaugural year, volunteers helped elevate the program by contributing to curriculum development, designing marketing materials, and facilitating workshops. If you would like to contribute to our leadership development pipeline, sign up to Feminist Center’s newsletter or email LeighB@feministcenter.org. Join our Committee: We envision that our new EVFP Advisory committee will provide guidance and support on various activities including recruitment, application and interview screening, curriculum mapping and development, fundraising, and help planning social events. If you are interested in joining, please email LeighB@feministcenter.org. Donate : Our EVFP Fellows are continuing advocacy “in the name of a true leader.” Your donation will help Feminist Women’s Health Center honor our first Community Engagement Coordinator, Errin J. Vuley, who led with passion in her work for abortion access, trans justice, and racial justice.